The Parish Council is the most local part of our democratic system and is closest to the people. Above it in the hierarchy of local government are Mid Suffolk District Council and Suffolk County Council. The council is currently directly responsible for providing and managing the allotments, maintaining the playing field and the play equipment, providing waste bins, seats and maintaining the village sign. We work closely with Suffolk County Council to maintain footpaths and highways and are the first port of call for you to report any highways or rights of way problems. 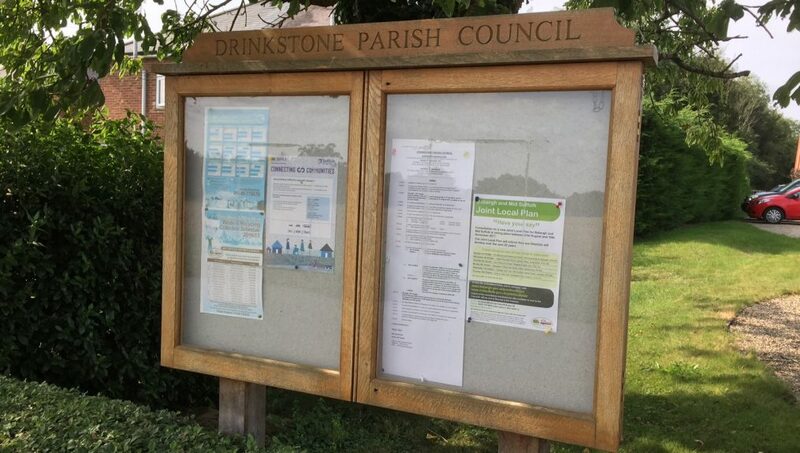 We are also statutory consultees on all planning matters affecting Drinkstone. Although we do not have the final say in planning decisions, we have the power to influence the planning process. Each year the council asks for a sum of money, called a precept, which is collected though your council tax. We use this money to improve facilities and services and to run the council. We can also apply for grants and loans. Decision making: at our meetings we decide which activities to support, where money should be spent, what services should be delivered and what policies should be implemented. Monitoring: we make sure that decisions lead to efficient and effective services by keeping an eye on how well things are working. Getting involved locally: as local representatives, we have responsibilities towards our parishioners and local organisations. Our day to day work as councillors may include meeting local organisations and other bodies that affect the wider community, and most importantly, bringing parishioners’ concerns to the attention of the council. Elections occur every 4 years. The current council was elected in May 2015, on a 78% turnout of voters. Where vacancies arise between elections councillors can be co-opted if necessary.